Mark your calendars and join us in Florida this May. AFC is working with The Guy Harvey Ocean Foundation, BBX Capital Foundation and Nova Southeastern University to help establish a new annual Artists for Conservation event in South Florida. The new festival will feature AFC's annual tour plus a selection of artwork by artists from AFC's Marine Explorer's Program. The event will also feature art and environmental education programming for youth and adults, lectures and films. A special teaser exhibit is tentatively scheduled for May 2014 (dates TBA). Bringing Artists for Conservation to Broward County is an opportunity to share artists passion for art and our environment. With budgets for art education suffering, and critical environmental and natural resources under stress, Artists for Conservation event in South Florida aims to bolster the region's commitment to both art and environment. It is truly art with a purpose, art for a cause. Support the campaign. Based in Vancouver, Canada, Artists for Conservation is a global society of more than 500 artists, both established names and up and coming artists. AFC's annual, marquee event - which takes place each fall - is the world's top conservation-themed art experience, featuring all original artwork by painters, sculptors and illustrators. Together with the art, conservation-focused ¬films, publications and informative presentations, the exhibit serves as a visually stunning and effective vehicle for conveying the importance of fostering creativity in art and protecting our wildlife and precious landscapes. Each piece of art on display does more than tell a story. It disseminates an important message about wildlife and what needs to be done to conserve our natural resources for our children and grandchildren to enjoy. It's also an opportunity for the public, teachers and students to meet and mingle with top international artists including celebrated ocean artist and conservationist, Dr.Guy Harvey. All artwork sales benefit wildlife conservation. Opening weekend activities feature a Meet-the-Artists reception, book signing, hosted film screenings with AFC President and Founder, Jeff Whiting, lectures by leading artists and youth workshop. Artists for Conservation aims to expand its reach with a second annual show, with the potential of becoming THE signature art event in Broward County, if not all of South Florida. The Guy Harvey Ocean Foundation and BBX Capital have stepped forward to help bring this world-class art exhibit and international cultural event to Fort Lauderdale. 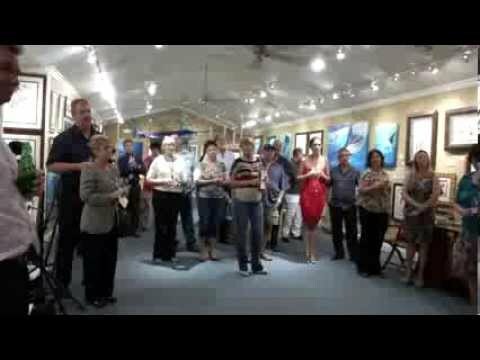 To support the campaign for Artists for Conservation - Fort Lauderdale at Power2Give.